They’re only 3.5 inches by 2 inches (usually) but those few inches are prime real estate. They introduce future customers / clients to not only you but your brand as well. How well are they representing and explaining the who, what, and where of you and your brand? Are they doing a great job or are they falling flat and leaving your customers / clients in the dark? Jade Café was asking themselves those same questions, and came to us to redesign their business cards to better reflect their brand. Above is their original business card. As you can see, it’s very dark, the whole logo gets lost, it’s hard to read the person’s name, and all of the contact information and company location is all the same size. What do you think they offer? What is it like there? From this card, all you gather is that this is a café of some sort located in La Crosse, Wisconsin, and judging by the name maybe serving Asian cuisine. Well, would you be surprised to learn that Jade Café serves frozen yogurt, coffee, sandwiches, salads, smoothies, and more? Plus, they offer a comfortable atmosphere with free Wi-Fi, dine in, carry out, and drive-thru options. None of those were conveyed to you by their old business card. 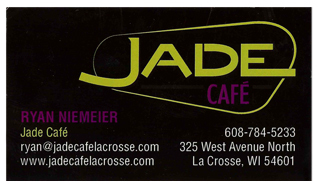 By using both sides of the business card we doubled the real estate and were able to give the user more information about Jade Café without making it hard to understand or overwhelming. On the front we played off of the shape of the logo for an interesting way to display and organize the contact information and social media icons. Customizing the colors of the social media icons not only made them blend in, but also stand out at the same time. This way the focus would be more “Yes, Jade Café is on all of these social media networks.” not “Here is all of these social media networks plopped on this business card.” Add to all of that what kind of food and drinks they offer and the front of this card gives the user a pretty good snapshot of what this company is all about. But we didn’t stop there, we used the back of the card to drive home the point that they have great coffee, frozen yogurt, and sandwiches by listing that out and showing some images of the products the offer. Add in free Wi-Fi and their dining options and the back of this card is not only eye-catching, but it explains Jade Café all on its own. We also had these printed on a sturdier cover paper and had both sides UV and aqueous coated giving them a nice glossy shine. Now, not every company needs do to use both sides of their business card, or have photography. But, they do need to have their business cards work and work hard for them. Sometimes all a customer / client sees is your business card. Does it convey what you want them to know and feel? If not, it may be time to revisit the overall look and feel of your business cards. If you need help with a business card redesign or overall branding, give us a call at 608-519-3070 or shoot us an e-mail at info@theblugroup.com.